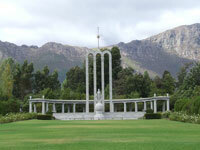 A major tourist attraction in the Franschhoek valley, the historic Huguenot Monument was erected in 1945 to commemorate and honour the French Huguenots who arrived in South Africa in 1688 after fleeing brutal persecution in their home country. The nearby museum documents the history of the settlers, from their flight from France to their arrival and successful establishment of the Franschhoek wine region in the Cape of Good Hope. The little museum contains a variety of Bibles, documents, furniture, utensils, and artefacts, providing insight into the life of the Huguenots in the Cape. The memorial is graceful and the calm of the place is moving, considering the violent history of the fleeing Huguenots. The three high arches symbolise the Holy Trinity and rising above that is the sun, representing righteousness, and the cross, representing the Christian faith of the Huguenots. The central female figure personifies religious freedom, with a Bible in one hand and a broken chain in the other. For any visitor interested in the history of French settlement in South Africa, or in the history of the beautiful Franschoek valley in general, a visit here will be rewarding.